So glad we have Dr. Z & Capt. K.
I find it interesting that, per his tweet, he was transferring due to family health but ended up 443 miles farther away from home (Fort Lauderdale). He must have some family in Fort Dodge, Iowa. Central Iowa feels like home to everyone! Simply couldn't have asked for better weather today. Michael Scott stood out to me right away. He's a little bigger than Josh Ward & seems to move just as well. Josh also looks good as always. Jeffrey Lubin & Rich Hall really pass the eyeball test as DB's. Lubin's a big corner at 6'2". Being that tall I thought he might get moved to safety, but no, he's at CB. Gavin Blunt looked good at WR. Big, tall, pretty fast & has nice moves. But Gavin won't see the field much this year. We're stacked at WR. Jonah Morris, Boogie Knight & Nate Stewart are 3 legit WR's. Add Andre Williams to that corps & it's quite loaded. Timothy Scipio is also a big, athletic WR who adds depth. Our offense is going to be quite multiple. It looks like Arth likes RB's who can catch the ball out of the backfield. We often had either Deltron Sands or that new walk-on from MUU line up in the backfield but go into motion out wide. This gave us a spread offense with Deltron, Jonah, Boogie & Nate out wide & Maverick Wolfey at TE. Bad news: Jonah Morris looked like he hurt his knee & had to be carted off the field. I pray it's not too serious. Abraham Alce is a tank. I didn't notice Devanier Floyd today. Did he practice? There were a lot of this year's signees at the game. At least I think that's who they were. There may have been some recruits at the game as well. I could only recognize OL Xavier Gray from Jackson. So I just assumed they were signees who will be freshmen next season. Defensively I was pleasantly surprised. Little concerned we are a little undersized front 7. Lako was everywhere. Surplus sale was not great. I was at the gate over by the field house a little early and was one of the first through the gate when they opened it only to find they opened up the southwest gate early so I ended up in a line of over 100 deep. Once I got in, there wasn't much left and I sense there wasn't a whole lot to start. The grab bags weren't great. The Athletic Department needs to take all of the leftover Matthew WIlson bobbleheads and ship them off to Missouri Western. Two grab bags= two MW bobbleheads. The weather was awesome. I actually got a little sunburned. It was nice to be on campus/show the girlfriend around. The surplus sale was a let down compared to prior years. Same shoes as last year., generic shirts they give out for free, tight workout shirt I'd never wear in public. They did seem to have a nice jersey selection if you were looking to grab one of those. Agree with clark re: the grab bags. I picked up 3 and got the same For Pete's Sake purple shirt, new rew run, and Detroit Roo Crew shirt in each of them. Along with 365 branded sunglasses, a zips head band, and a Matthew Wilson bobblehead. I mean you definitely get your money's worth, but some variance would've been nice. I liked seeing the coaches in action during the drills. I basically have zero thoughts on the players. I did have to leave at 1 so maybe I missed some of the action, but by that time there were about 10 live-action 11 on 11 reps in total. The only comments I unfortunately have is that the Mount Union transfer does look like he can contribute. 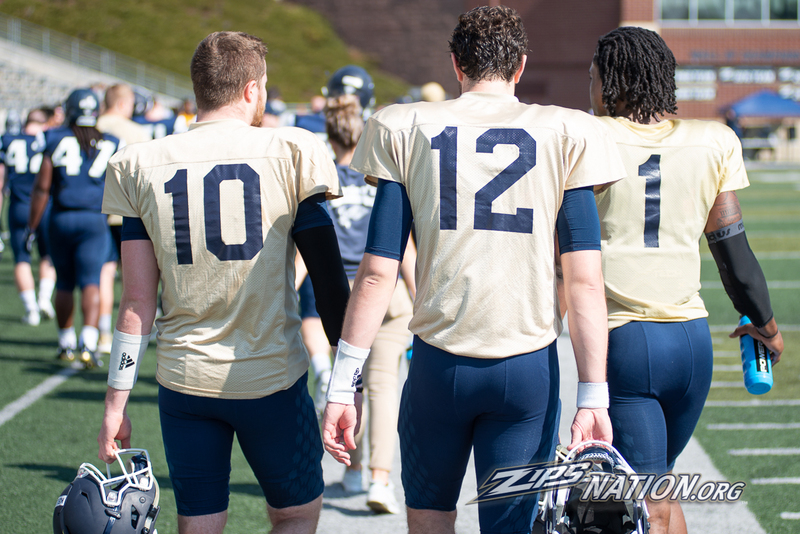 I know yesterday was advertised as being a bit different than your average spring game, but I wish there was more 11 on 11s. Maybe most of the time after I left was just that. better in the long run. The WR's looked 'fast'. DB's were doing a lot of grabbing in drills and scrimmage. Nelson looks a little thicker arm looks strong. Want to see if Arth can coach him up to make better and quicker decisions. Liked the regular use of the TE and wing back. Arth has a nice assortment of QB's to work with. Shields caught my eye for some reason. Obviously a couple of them won't be in the mix. Hard to tell a lot from the scrimmages. The Offense looked good but they were up against what may be right now a suspect front 7. Looks like the D was 3 down and moving a stand up from side to side depending on the field position and circumstances. Lako did stand out. Just liked the energy and pace this coaching staff is trying to instill. Alex is 6'3", Rob is 6'2", and Kato is 6'1" according to my most recent roster sheet (April 5th). Even though they are not standing (perfectly) next to each other, you can make somewhat of a judgement from this (April 6th) photo. with the Zips scoring a nation-worst five rushing touchdowns in 2018"